Warm form the oven, served with salted homemade butter on a RoughStuff Medium Stretch Board. 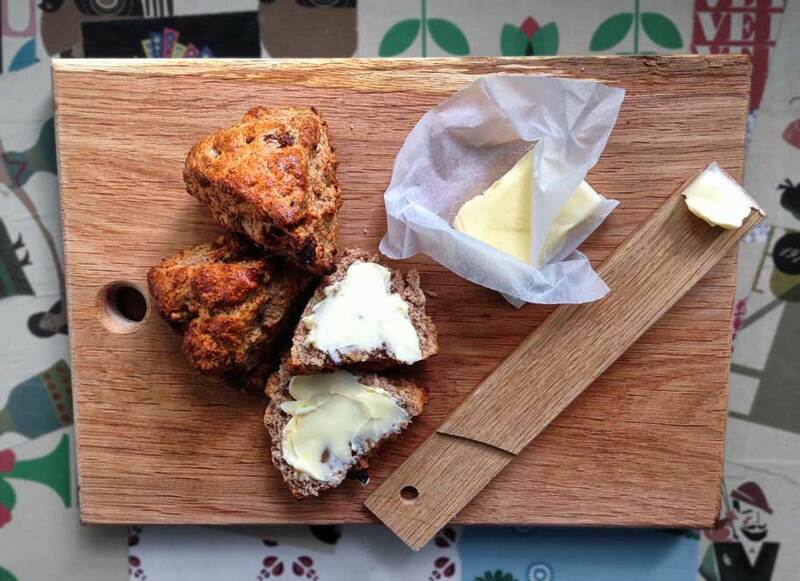 Emma's homemade date and walnut wholemeal scones taste great slathered with slightly salty homemade butter and washed down with a mug of tea. 1 Egg beaten for wash..
Preheat oven to 220C /220C fan / Gas Mark 6. Combine flour and baking powder and rub in the butter to resemble breadcrumbs. Mix in the palm sugar, walnuts and dates and add enough milk to combine to make a soft dough. Handle as little as possible. Shape into a round approx 4cm thick and cut into segments. Place on a greased baking tray and brush with egg wash.
Bake for 12-15 mins until golden brown.